Feel the freedom of the great outdoors. Made to last, the Indy Outdoor can withstand storms, seasons and years of use. Protected from the elements by its weather-tight covers that come standard with every Indy Outdoor, this stair lift allows for mobility no matter what the weather. Comfort is key with a wide 19-inch seat that swivels 90 degreens. Supporting up to 350 lbs, the Indy Outdoor offers top of the line safety features and lifts smooth from start to finish. Every Indy Outdoor Stair Lift comes with a weather-tight component cover, header cover and seat and unit cover. These standard features help to ensure the Indy Outdoor’s longevity and protection.Get up and down your porch stairs in rain, snow, or sleet with the Indy Outdoor Stair Lift. Built to withstand years of exposure to storms and seasonal changes, the Indy Outdoor Stair Lift has weather-tight covers and provides mobility no matter what. To accommodate your needs, this outdoor stair lift can be installed to either side of a staircase and mounts directly to the stairs instead of a wall. Indy Outdoor Stair Lifts come with all common features, including sensors and a swivel seat, and support up to 350 pounds. Don’t let your porch stairs stand in your way. Make your home accessible all around with the Indy Outdoor Stair Lift. Low voltage Class 2 circuit for protection in the event of a short circuit. 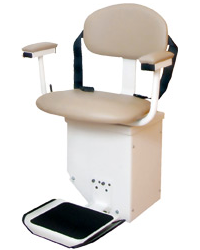 Seat and footrest fold to 14″. Safety sensors stop lift to avoid stalls if something is in the way of the lift operating properly. Mounts to the stairs instead of the wall. Seat swivels 90° toward landing at every level for easy entry and exit. Can be installed on either side of the staircase. Smooth ride from start to finish.